We’d love your help. Let us know what’s wrong with this preview of The Dohmestics by Mohanalakshmi Rajakumar. The unending gossip and unrelenti Edna, Amira, and Noof are neighbors but that doesn't mean they know what happens behind closed doors or that they have anything in common with their hired help. Published December 20th 2012 by Amazon Digital Services, Inc.
To ask other readers questions about The Dohmestics, please sign up. I found this a really absorbing read and a compelling portrait of daily life for ordinary people in the Middle East, in this instance Qatar. Having just come back from a visit to friends in Abu Dhabi, where I assume many of the same conditions prevail, I recognised many aspects of everyday life and atmosphere, and the story felt very authentic. The story concerns six very different women who have by chance ended up in a typical Gulf States gated compound where they live a privileged life with the I found this a really absorbing read and a compelling portrait of daily life for ordinary people in the Middle East, in this instance Qatar. Having just come back from a visit to friends in Abu Dhabi, where I assume many of the same conditions prevail, I recognised many aspects of everyday life and atmosphere, and the story felt very authentic. The story concerns six very different women who have by chance ended up in a typical Gulf States gated compound where they live a privileged life with the help of maids and other compound workers. But in spite of their relative wealth the women have their own problems and setbacks to deal with and as the story plays out the reader realises that privilege is always only relative. The novel is an insider’s view of what often seems to a western reader an alien culture but one which becomes more comprehensible as the story develops. I particularly enjoyed the small details, like descriptions of going to the mall with the maid in tow trying to control the spoilt child, driving on roads surrounded by impatient drivers, how taking off an abaya or putting one on to leave the house is just routine and not some strange ritual Much in the manner of The Help, the lives of the maids is very effectively described, and certainly the reader’s heart goes out to them. So all in all this is a very enjoyable and illuminating novel indeed and well worth reading to gain an insight into the culture of the Gulf States. . The Dohmestics was a beautiful novel. I will say that I have read other works by this author, and have always been mesmerized by the intricate care that she takes in weaving her tales. The Dohmestics was no different:) The story follows six women, three are maids and nannies with the other three their employers. The story details the relationship amongst the women who come from varying socio-economic status as well as different barriers involving race and ethics. As always Mohanalakshmi Rajakumar The Dohmestics was a beautiful novel. I will say that I have read other works by this author, and have always been mesmerized by the intricate care that she takes in weaving her tales. The Dohmestics was no different:) The story follows six women, three are maids and nannies with the other three their employers. The story details the relationship amongst the women who come from varying socio-economic status as well as different barriers involving race and ethics. As always Mohanalakshmi Rajakumar gives a inside view of a culture, reflecting the ups and downs of a people who love, hate and are trying to live their daily loves as triumphantly as possible. The Dohmestics was extremely well written,with wonderful details that caused the characters to be full and rich, making them seem alive on the page. Rajakumar is a master at digging into the depth of the culture she is revealing, creating an experience which is entertaining as well as educational. The story was built with care, never lagging, but flowing poetically drawing the reader further into each page. Beautifully written, pleasant pacing, an engrossing treat. I digged in since I loved ‘The Help’ but oh well, it is completely different from that one. So full points for originality but none when it comes to me liking the book. Unlike a closely bound story, this book is more scattered in terms of characters and their various experiences. I couldn't get my head around it. It gives an insider’s view into the lives of families and their maids and what goes on in their daily life. I got a bit confused with keeping track of the characters but as I always say, I am ADD so it may not happen to you. The book doesn’t have a huge list of characters anyhow. It’s a slow moving book that shows the relation between high-class couples, employer and their maid and the relationship between maids. There are a lot of emotions involved – from desperation to future aims to sorrow. The book ends on a sad note. Life in the compound Maria lives in is never boring. There's a multitude of people to talk to, as well as children to take care. For her, this is a normal way of life, and she wouldn't have things any other way. After all, it allows her to bring food to the table in order to provide her family with their every need. In her eyes, she has everything she could ever ask for and more. When Maria begins experiencing things she never imagined, life starts taking a different turn. She's not quite sure as Life in the compound Maria lives in is never boring. There's a multitude of people to talk to, as well as children to take care. For her, this is a normal way of life, and she wouldn't have things any other way. After all, it allows her to bring food to the table in order to provide her family with their every need. In her eyes, she has everything she could ever ask for and more. When Maria begins experiencing things she never imagined, life starts taking a different turn. She's not quite sure as to what's wrong with her, and she's afraid of confiding in someone for fear of losing her livelihood. She's come too far in order to lose everything now. Yet she can't help but to wonder as to whether her recent ailments are a precursor to the unthinkable. A new child means another mouth to feed, something she can't quite afford right now. On the other hand, her health might be in question. Determined to make the most of the situation at hand, Maria keeps quiet about the goings-on within her body. In her mind's eye, she hopes that in doing so no one else will take notice of her odd behavior. Unfortunately, that's just wishful thinking. Eyes soon slowly turn her way, and questions arise. Questions, she realizes, she has no proper answer to. Yet when the tables are turned, and someone else's livelihood comes into play, Maria comes to the realization that her life isn't as bad as it seems. A thought-provoking story, the reader becomes immersed in the lives of several women as they make do with the lots they've been dealt in life. While their ways of life might not be ideal for some, they've learned to coexist in a society that dictates when, where, and how they must live. Full of hope and the need to make the best of their worlds, these women interact with one another each and every day, never once realizing just how different they are from one another. Until the very moment when one of their own changes her very circumstance, only then can they truly see just how different they are. Six women live in the same gated community. Three are women of means. Three serve them. This poignant tale crosses racial, socio-economic, & moral barricades. Our first trio- Edna, Amira, & Noof- are well-off & mostly utilize their time fretting over their families & their help. Maria, Lillie, & Maya run these households as maids & nannies. Edna is the neutral party. Currently without ‘help’, her main concern is her husband’s fidelity. Noof fears the same, but us kind t Six women live in the same gated community. Three are women of means. Three serve them. This poignant tale crosses racial, socio-economic, & moral barricades. Edna is the neutral party. Currently without ‘help’, her main concern is her husband’s fidelity. Noof fears the same, but us kind to her nanny/maid Maria & tries to help her. Amira on the other hand has a nasty temper with her aide, Maya. Maya is treated more like a slave than hired help. Lillie floats from home to home while supplementing her income in more shady lines of work. All 6 have issues. The wealthy fret over keeping up appearances while the help desire to send money home to their own families. When disaster hits within the tight-knit walls of the community, there’s a ripple that affects all six- with devastating results. Join in the story to laugh & cry with these unique ladies! Fabulous from start to finish, there isn’t a thing that I didn’t love about ‘The Dohmestics’. Each of the women is vastly extraordinary yet entirely believable. From a plot standpoint, it is fresh & original. I want to stand up & cheer that we finally have a book for women that doesn’t involve impossible romantic situations or shopping addictions! This is a book about women that you’ll want to recommend to your friends. I sure did. It is absolutely clean & any risky scenes are more implied than described. Its proof that a book can be written that will appeal to a majority of women of all ages. An absolute ‘must read’ 5 star novel, it’ll be perfect for summertime reading and/or book clubs. I’m confident that you’ll love it as I did. I received 1 eBook in exchange for an honest review. All opinions are mine. This was a remarkably well written novel. I appreciated how the author does not waste a great deal of time on extraneous descriptions. She sets the scene remarkably well, but also leaves room for the reader to use their imagination to help build this world. It was also quite unique with an extremely intriguing premise. It is a very different outlook on life and was very interesting to read about. The author takes the lives of many individuals in multiple classes and shows their interactions and This was a remarkably well written novel. I appreciated how the author does not waste a great deal of time on extraneous descriptions. She sets the scene remarkably well, but also leaves room for the reader to use their imagination to help build this world. It was also quite unique with an extremely intriguing premise. It is a very different outlook on life and was very interesting to read about. The author takes the lives of many individuals in multiple classes and shows their interactions and reactions to one another in a very entertaining manner. This is extra interesting because there is a veritable melting pot of character types and nationalities within this novel that all fit together to create an unforgettable story. She also switches perspective between the characters to help illustrate this and to give the reader a great deal of detail and information that would otherwise be possible. She also did so quite smoothly and clearly. There is a rather large cast of characters in this novel, but you get to know each and every one of them as an individual. It is also a multicultural cast of characters with interracial families that all live together in relative harmony. Rajakumar takes the time to develop each character separately. They each possess qualities that tie them directly to their cultural origin, while also being the individual who lives within this community. I found it very refreshing to read about such a different outlook on life. It really made me think. Above all, however, this novel kept me entertained throughout. 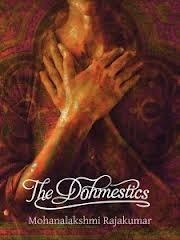 I'm more of the blood and guts kind of reader, but when I was given an opportunity to read The Dohmestics I took it. And, I am glad that I did. This thought-provoking book hooked me right from the first page. On the surface, it appears to be about six women whose lives intertwine, three are privileged women and three are their servants. But, there is so much more to this book. It pulled me into a culture and then used that culture as a vehicle to explore the relationships and dynamics between the I'm more of the blood and guts kind of reader, but when I was given an opportunity to read The Dohmestics I took it. And, I am glad that I did. It pulled me into a culture and then used that culture as a vehicle to explore the relationships and dynamics between the privileged and the poverty-stricken; between workers and employees; between men and women; between power and corruption. I was taken on a journey that challenged me to not only understand this foreign culture, but to view my own with enlightened eyes. I loved how it took a small decision and traced the ripples of that decision to its' tragic end. But even in tragedy there existed an opportunity for people to shine, to rise above all that limits them and to reach out to each other. This book took me from anger to sadness to strength. Quite the journey, and one I highly recommend. Mohana Rajakumar’s newest book The Dohmestics, marketed as part “Desperate Housewives” part “The Help,” traces the unfolding drama in a middle eastern nation’s expatriate compound between three women Edna, Amria, and Noof and three maids, Lillie, Maria, and Maya. As the story unfolds, Rajakumar weaves universal human drama of love, lust, hope and loss within and around the cultural tensions and dynamics between east and west and the halves and the have-nots. At times I had difficulty keeping the Mohana Rajakumar’s newest book The Dohmestics, marketed as part “Desperate Housewives” part “The Help,” traces the unfolding drama in a middle eastern nation’s expatriate compound between three women Edna, Amria, and Noof and three maids, Lillie, Maria, and Maya. As the story unfolds, Rajakumar weaves universal human drama of love, lust, hope and loss within and around the cultural tensions and dynamics between east and west and the halves and the have-nots. At times I had difficulty keeping the characters straight, especially the maids, and this led to some confusion in staying with the story. But, I liked the characters as they evoked both admiration, compassion, and amusement. And Rajakumar’s ability to bring a truly diverse group of characters together in an interesting and surprising plot kept me reading. I rate this book a ‘good’ read. Mohana Rajakumar’s newest book The Dohmestics, marketed as part “Desperate Housewives” part “The Help,” traces the unfolding drama 17229250in a middle eastern nation’s expatriate compound between three women Edna, Amria, and Noof and three maids, Lillie, Maria, and Maya. As the story unfolds, Rajakumar weaves universal human drama of love, lust, hope and loss within and around the cultural tensions and dynamics between east and west and the halves and the have-nots. At times I had difficulty keep Mohana Rajakumar’s newest book The Dohmestics, marketed as part “Desperate Housewives” part “The Help,” traces the unfolding drama 17229250in a middle eastern nation’s expatriate compound between three women Edna, Amria, and Noof and three maids, Lillie, Maria, and Maya. As the story unfolds, Rajakumar weaves universal human drama of love, lust, hope and loss within and around the cultural tensions and dynamics between east and west and the halves and the have-nots. Wow, what an eye-opening experience this book was. The peek into the lives of the wives, nannies, and servants of another culture. In California, particularly my house, the idea of having a live in maid/chef/nanny is a dream many a new mother has, but then reality sets in and she moves on. While some people might have a live in nanny to help with children when both parents work, since it’s about the same or cheaper than full time daycare, we tend to treat them as members of the family. This view Wow, what an eye-opening experience this book was. The peek into the lives of the wives, nannies, and servants of another culture. In California, particularly my house, the idea of having a live in maid/chef/nanny is a dream many a new mother has, but then reality sets in and she moves on. While some people might have a live in nanny to help with children when both parents work, since it’s about the same or cheaper than full time daycare, we tend to treat them as members of the family. This view of the position of a maid/nanny is very different. Each of the women in this story show a different side to the same story. The story is told in a quasi-omniscient form so that we could see what two of the main character think and act. I found it an interesting look into the “help” in a new light. I give this book 4 out of 5 clouds. The Dohmestics is an easy and enjoyable read. It offers a glimpse into the lives of women in a gulf state, particularly 3 domestic servants and 3 "madams" and explored the issues of public and private, of "home", relationships between women and between women and their home help. The author focused on a number of contemporary issues facing women, not only in the gulf, but her story telling is engaging and entertaining, never heavy. Recommended. Fascinating view of life on a compound for ex-patriots in, presumably, Doha, Qatar. The novel entwines the stories of three ladies-of-the-house and three maids, domestic workers imported from South Asia. In the beginning it's just interesting to read about the trivial daily concerns of these women, but by the end the drama is fairly gripping, or was for me. I thought this was a decent read. The story follows the life of maids interacting with high class society. There are plenty of emotion along the way, and gossip as well. The amount of characters to follow made the story somewhat confusing as it moved in a slower pace. Overall, a decent read and I see a lot of potential from the author. An interesting look at daily lives of ex-pat women and their domestic help living in company compounds in Doha. The general treatment of the Filipino and Sri Lankan maids is disturbing. Mohanalakshmi Rajakumar is a South Asian American who has lived in Qatar since 2005. Moving to the Arabian Desert was fortuitous in many ways since this is where she met her husband, had two sons, and became a writer. She has since published eight e-books, including a momoir for first time mothers, Mommy But Still Me; a guide for aspiring writers, So You Want to Sell a Million Copies; a short stor Mohanalakshmi Rajakumar is a South Asian American who has lived in Qatar since 2005. Moving to the Arabian Desert was fortuitous in many ways since this is where she met her husband, had two sons, and became a writer. She has since published eight e-books, including a momoir for first time mothers, Mommy But Still Me; a guide for aspiring writers, So You Want to Sell a Million Copies; a short story collection, Coloured and Other Stories; and a novel about women’s friendships, Saving Peace.